I loved the way this story began, there was no easing into just how powerful this demonic presence was, it had in its present form already almost destroyed a whole nation and other cultures that would take years to rebuild. It was 1944 and as the all consuming entity transferred into a new victim it left its former shell to face the carnage of the previous years. Oh wow I just sat back and thought up some of the vilest rulers that I could bring to mind through history then wondered where this now female form would end up. The story then jumps a few years down the line and to two more than mischievous young boys. This part brought back memories of my childhood as I think it would some other readers too because most streets had that little old cat lady that just seemed really strange, the one that burst balls if they went in her garden and just seemed to hate kids. Well that was like a red flag to a bull, with dares of knock and run. Gee’s how I cringe now. Well two boys go one step further because one of this wild duo has a cruel streak and the other is easily lead, the price that has to be paid comes in the form of an ever-increasing body count in present day, years after the young boys have grown up! This author duo really are on the same wave length as the writing runs in perfect harmony with each following the other effortlessly sentence after sentence. It felt like I was watching a movie as the story unfolded, one of those edge of your seats films where I wanted to shout out ‘stay away from her’, but of course I knew more than the characters did so I read with apprehension not knowing what was going to happen just that something terrible would. The story controlled the pace that I read and had more than its fair share of OMG moments. There is some animal cruelty in the story so if this makes it too hard to read I am just forewarning you that it is part of the story. A very well planned and executed story. A stand alone novel that really stands out! I’ve always loved writing. What started as a hobby became a career and a way of life. I write for middle grade, YA, reluctant readers, plus romance and crime for adults. I also write non-fiction. I have over 30 books published., the latest being a co-authored book with Robert D. Tysall, entitled The Bitter End. It’s published by Bloodhound Books. Robert Tysall was born and brought up in Rugby, Warwickshire, and played the sport the town is famous for in his youth, until he discovered a passion and talent for music and photography. His career so far has been a busy mix of being lead vocalist and percussionist in bands, playing as far afield as Bahrain in the Middle East; plus working as a professional freelance photographer. He is currently in a 60s, 70s & Beatles duo, and lives in Warwickshire with his wife, Heather. He has two grown up children who have both followed in his footsteps with their musical talents. Rob is multi published on the photographic side of things with countless magazine articles published, having worked with writer Ann Evans for many years as a writer/photographer duo. 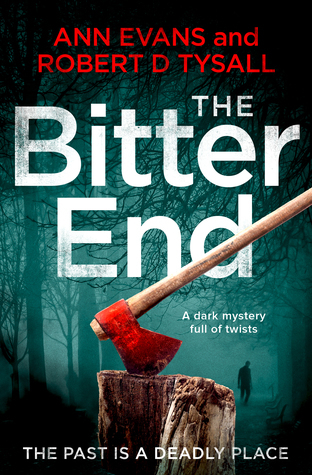 For quite some time he has dabbled with the idea of writing a novel – a dream which has finally come to fruition as Rob and Ann teamed up to collaborate on a supernatural thriller which was released by Bloodhound Books on 4th July 2018. Now that he has been bitten by the writing bug, there’s no stopping him, and two more book collaborations are currently in the pipeline. Thank you for the brilliant review, Susan. Rob and I are so pleased that you enjoyed it. Hi Susan, I have to say that this is just about as good as a review gets, thank you for a brilliant understanding of our book (I like the start as well).